Seriously I didn't know at first what exactly this phrase mean until when I watched several movies that has a scene of guys or gangster on an underground joint gambling (normally it's poker). 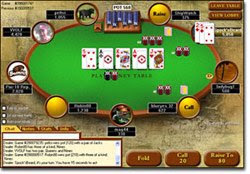 My husband enjoys playing poker online and tends to use the Betfair and Party Poker websites. He is pretty good at poker and I don't mind him playing it as long as he treats me to a night out if he wins a decent amount.